SIG is a leading distributor of specialist building products in Europe. The Group has a product and service offering of significant scale with strong positions in its three core product areas of Insulation and Energy Management, Exteriors and Interiors. Whilst playing a crucial role in the supply chain for both the new and RMI (repairs, maintenance and improvement) construction markets. 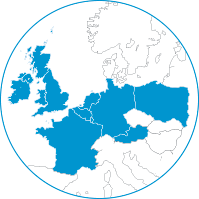 Operating from trading sites across the UK and Ireland and Mainland Europe, SIG employs just over 9,000 people – with the Group’s main countries of operation are the UK, France and Germany. o SIG is the largest specialist supplier of roofing products in the UK and Ireland and the leading independent supplier in France. o SIG is the largest supplier of insulation products in Europe. The Group is the market leader in the UK, Ireland, Germany and Poland and the leader in industrial insulation in France. o SIG is a leading supplier of all products required for the interior fit out of all types of buildings in Europe.